Russian jet maker Sukhoi continues the development of the T-50 fifth-generation fighter for the national air force under the PAK FA program. The fifth prototype of this aircraft made its hour-long maiden flight at Komsomolsk-on-Amur on October 28. The manufacturer is not explaining how the T-50-5 differs from the previous prototypes, nor does it disclose what kind of tests the airframe is intended for. After the factory trials, T-50-5 will join the other four prototypes, which are currently being test-flown at Zhukovsky outside Moscow. Two more airframes are involved in the ground test: one of them is used as a ground rig, the other one is undergoing static tests. The T-50 is intended to replace 4th generation Sukhoi Su-27/30 aircraft in the Russian Air Force. It will also serve as the baseline for the Russo-Indian Fifth Generation Fighter Aircraft, being developed jointly by Sukhoi and Hindustan Aeronautics Limited. The first T-50 prototype flew in January 2010; the flight test program started in April same year. The T-50-3 prototype, equipped with an AESA radar, joined the trials in 2012, the same year as tests began on the fighter’s in-flight refueling capability. 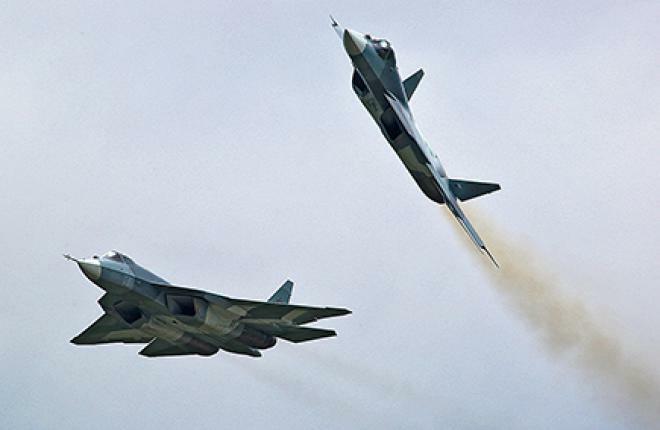 According to Sukhoi, in the three years of testing the T-50 prototypes completed more than 450 flights in total.